First, let me say I am an electrical ignoramous. I can rebuild a motor from the crank no problem but electrical I am clueless. I am having incredible difficulty figuring out the wiring on my 14' Starcraft with my 25hp Merc 2 stroke. Motor has electric start and there is about a mile of wire under the console which I don't understand. The original ignition switch failed on my the year before last and I have been pull starting the motor to start since then. I tried to replace the switch last year, but got stumped. The starter solenoid also failed at the same time which made my troubleshooting even more difficult. Anyway, I have everything figured out for the most part, except the kill circuit. As I understand it, the kill circuit on these 2 strokes is a grounding system. 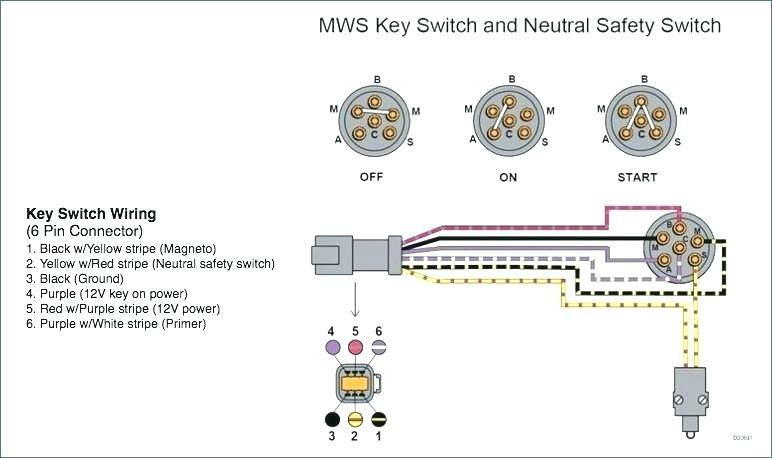 It's an open circuit when in operation and closes to ground when the kill switch tether is pulled or the key is turned off to ground the coils. I have the kill switch tether working properly, but when I turn the key to the off position it doesn't kill the motor. There are two sets of wires I can't seem to trace to anywhere. One set of black wires (3 wires connecting to one terminal) and one set of purple wires also all connected to one terminal. The black ones trace to ground as one would expect, but the purple wires I can't find continuity with anything on the motor. I do notice that the alarm buzzer seems wired to the purple wires. Can anyone help? I think I posted about this issue last year, and here I am again. Please help me from bringing this boat to my mechanic who is really good but about $150 an hour! Purple - That wire color is used to ‘power’ your gauges or any circuit that needs to be ON whenever the outboard keyswitch is turned to RUN. Ignition Kill - That is a black with yellow striped wire. I’d look for some Merc ignition switch wiring schematics online if I were you. But I also believe I have a Merc ignition switch & harness I can send you, if interested. When you pull start it ... likely you don’t need the keyswitch turned to ON, do you? If not, then that is also a sign that the ignition kill circuit is inoperable. If this is a Commander control chances are the key switch is broken or has been disconnected.The stop circuit wire(blk/yel)will be found at the lanyard kill switch and then go to the key switch(if these wires are not color coded it will be the one not grounded when key is on).Test the key switch-with battery disconnected check continuity to ground-one of the terminals should go on and off with the key.m.w. It would if the switch was installed. I have all the wires completely disconnected and it starts just fine with the pull start, I just have to ground out the magneto wire when I want to stop the engine. Or choke it out. The purple wire, it makes sense what you say, but all my livewell, bilge and lights work just fine with it disconnected so I don't know what they go to. I have everything hooked up right now sans the purple wires and the 3 black wires. It starts with the key, the electric choke works, the pull tether works to shut off the motor, it's just when I turn the key switch back to "off" it keeps running. I can use the tether to kill the motor but I'd rather get the ignition switch to work right. I was able to trace the wires (and yes you are good with your memory on the colors) and have the solenoid, battery wire, ignition, choke/primer and what I think are the correct magneto kill wires connected but something isn't right. They key switch is brand new, however, I am guessing at it being the right switch. It seems to have the right amount of contacts on the back, but the original switch was completely encased with hot glue making it impossible to see what was connected to where.